September 7th, 1934 - born in a political prison in Nizhni-Novgorod (Gorki), USSR. 1937 - the parents get free, the family moves to Moscow. 1938 - introduced to jazz through Duke Ellington and Mills Brothers records. 1941-44 - refugee evacuation to Asia, starvation and diseases. Father dies in 1942. 1951-57 - Moscow University Phys-Tech faculty; top academians Lev Landau, Peter Kapitsa, Andrei Sakharov among professors. 1953 - nomination to the Olympic swimming team; declines and switches to a musical hobby; self-training on harmony, clarinet and tenor-sax. 1954-60 - plays in jazz bands, sings in a vocal quartet, composes themes, writes arrangements and scores. 1957 - meets jazzmen from the world, plays jams at the World Youth and Students Festival. 1958 - comes to Leningrad to jam at the opening of the first Soviet jazz club; the first article appears at the Polish monthly Jazz. 1959 - brings Moscow jazzmen to an Estonian jazz festival, debut as emcee speaking Russian, English and Estonian. 1960 - hosts NY Jazz Quartet (Idrees Sulieman - tp, Oscar Dennard - p, Jamil Nasser - b, Earl Smith - dr) that expresses will to stay in USSR to live and play jazz; establishes the Moscow Jazz Club, becomes its first president, starts lecturing on jazz; escalates jazz activity national and worldwide. 1962 - arranges Soviet jazz breakthrough to Europe; banned to come with; gets a personal dedication at the first new Soviet jazz recording made in Poland. 1965 - first visit abroad to Prague and Warsaw international jazz festivals; starts Club Metronome weekly jazz broadcast on the national radio together with Arkadi Petrov and Leonid Pereverzev. 1967 - heads International Jazz Symposium at the Tallinn Jazz Festival; together with Alexander Tsfasman takes part in the Constituent Assembly of the European Jazz Federation; became a Jazz Forum correspondent in the Soviet Union. 1969-82 - teaches privately History of Jazz, History of Jazz Styles, Orientation in Jazz Harmony Changes, World History of Musical Improvisation, Theoretical Aesthetics, Foundations of Improvisation. 1971 - doctorship in engineering is conferred. 1972 - pioneer book "Soviet Jazz - a Historical Survey" is published. 1973 - elected to the Advisory Board of the West Berlin Jazz Tage. 1975 - certificated as lecturer-musicologist by State Moscow Philharmony; collaboration with Philharmony begins. 1977 - elaborates educational jazz concert series for the Soviet East (not realized) and appointed as a member of the Artistic Council of the Russian State Concert o awarded with Polish medal For Cultural Merits together with jazz celebrities Willis Conover of USA and Joachim Ernst Berendt of Germany. 1978 - invited to "Melodia" to write cover articles to jazz albums. 1981 - starts "Jazz Plus Jazz" concert series in Moscow Olympic Village. 1982 - appointed to the Artistic Council of "Melodia" as editor and producer. 1983 - elected to the Board of the Tulane Jazz Archives in New Orleans; the prise-winning film We Jazzmen based on the book Soviet Jazz comes out. 1985 - gets in hospital with nervous disease. 1986 - quits engineer and scientific job to be a free lance jazz artist. 1987 - starts shortwave weekly broadcast From Moscow With Jazz for USA with Nick Kournakov; emcees Dave Brubeck and Pat Metheny concerts in the USSR. Jazz tour at Syberia, Far East and Kamchatka with Greg Fine Trio. Mother dies. 1988 - four weeks US tour with lectures and presentation of Soviet Jazz All Stars; leads master classes and seminars on jazz journalism and jazz aesthetics at the Berklee College of Music in Boston; gives lectures Jazz in the East in Ruse and Sophia, Bulgaria. 1989 - hosts Jazz Courier monthly show at the Moscow TV; is elected to be the head of the Critics Section of the Moscow Literary Society; takes part in "Fallen Leaves" TV documentary on the fate of Soviet jazzmen; visits Alaska to establish jazz exchange with Siberia; directs World International Jazz Meets Folklore festival in Abakan, Siberia; emcees SU-US Jazz Concerts in San-Francisco; during six weeks crosses the USA lecturing on jazz. 1990 - together with Leonard Feather a lecturer to the Hampton-Chevron Jazz Festival in Moscow, Idaho where presents a horn-wonder Arkadi Schilkloper awarded with a professional instrument to be his own; emcees Dizzy's concert in Moscow, USSR; makes BYU's Synthesis Orchesta Soviet tour; invited as special guest and lecturer to the Fairbanks Summer Art Festival, Alaska and to the Ingolstadt Jazz Tage, Bavaria. 1991 - establishes the Union of Literators of Russia and is elected the President; founds and directs the annual International Jazz By The Ocean festival in Vladivostok; coestablishes with Oleg Tcherniayev Jazzland club in Moscow. 1992 - directs the International Jazz Week in Yalta; With Oleg Tcherniayev brings a bunch of Russian jazz ensembles to Pori Festival; musical director of Moscow-Rio-NewYork Jazz Festival in Moscow. 1993-1994 - works on BATASH novel, collecting archive materials on Batashev's kin. With Igor Berukshtis hosts Jazz Hour on Radio Liberte (Russian service). As a member of the Presidential Social Chamber he has elaborated the Federal Program of Social Support (concerning free-lance artists). As a member of Coordinating Council of Russian Creative Unions he elaborates a bill about free-lance artists and other “creative workers” and their unions. Two versions of the bill were approved unanimously by Russian Parliament and both times were vetoed by both Russian Presidents. 1998 - hosts a weekly jazz hour on the Radio-1 for the largest audience of the former USSR; emsees Oleg Lundstrem Orchestra at the X International Jazz Festival at Santa Barbara, California; starts Jazz For Every One concert series at the Grand Hall of the Moscow Conservatory. 1999 - a fruitful creative collaboration with impresario Maya Kotchoubeyeva begins; from now on many conceptual concerts like "Russian Folk Jazz", "Jazz In Chopin Style" were conceived together; gets honorary doctor degree from International East European University; became the President of new established Russian Jazz Critics Guild, together with Maya runs series of popular jazz concerts at the Moscow Tchaikovski Hall. 2000 - introduces Russian jazz to the President of Russia Vladimir Putin and the President of the USA Bill Clinton in the Kremlin, together with Maya starts a Jazz Dancing Club at the Golden Hall of the Rossia Hotel, celebrates Louis Armstrong Centennial at the Moscow Conservatory Grand Concert Hall and runs The Great Satchmo Festival at the Moscow Hermitage Garden. 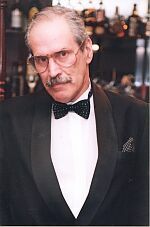 2001 - appointed art-director to the Odessa Jazz Carnival; visits as a guest of honor the New Orleans Jazz and Heritage Festival dedicated to Louis Armstrong's centennial; appears as a jazz festival MC in movie "Autumn Blues", a musical love story; realizes, together with Maya Kotchoubeyeva, Jazz Club at the Art Center of the Academy of Russian Art and big project "Eddie Rosner. The Orchestra's Comeback" at the Tchaikovski Hall; unique novel "BATASH" and biographical dictionary "Musicians of the World" are published. 2002 - elected as a full member to the Academy of Art Criticism; together with Maya Kotchoubeyeva - jazz concert to celebrate 80th anniversary of Moscow Philharmony with Jenny Evans, Rudi Martini and Leningrad Dixieland; dedication to Ella Fitzgerald with Roberta Gambarini; "SecondLine.USA" carnival at the Hermitage garden; jubilee festival "80 Years of Russian Jazz" at the Tchaikovski Hall; "Jazz Chopin Style" (with Andrzej Jagodzinski Trio of Poland) and a concert-reminiscence "Alexander Tsfasman Birthday" at Moscow Conservatory. 2003 - the unprecedented "Jazz From the Orient" concert (together with Maya), where musicians from Asia (Rishad Shafi), Africa (Dhaffer Youssef), America (Datevik Hovanessian and her Trio) and Russia took part, concludes the series "Jazz For Every One" at the Grand Hall. 2004 - together with Maya an unprecedented concert of David Berger's Sultans Of Swing with several premiers - Rhapsody in Blue transcribed by Oleg Lundstrem, Tchaikovski's Nutcracker swingingly rendered by Ellington, Strayhorn and Berger and Black Brown and Beige - headlined by Nikolai Petrov, David Goloshchokin and Helena Obraztsova. The presidency of the Russian Union of Literators is ended. 2005 - collaboration with JazzART Magazine, emsees the Rostov-on-Don Jubilee Bigband Jazz Festival, appears as a guest of honor at the jubilee jazz festival at Yaroslavl, guest of honor and emcee of the Second International Jazz Festival “Jazz in Rostov Style” at Rostov-on-Don. 2006 – emcees international jazz festivals at Minsk and Ekaterinburg. For novel “BATASH” is invited and admitted unanimously into the Moscow Union of Writers. Is engaged in the compiling of the collected works.